Being mindful about what you do every morning and evening, can improve your health & happiness. You have probably heard about morning and evening rituals. That they make a big difference in your life and will make you happier and healthier. It sounds good, doesn’t it? Maybe you also started to create rituals? I do have my own rituals every morning and every night and I wouldn’t trade them for anything else but a major emergency because they changed my life for the better. But once I understood the reason why early mornings and the time before we go to bed are so crucial for our overall health and well-being, I am even more mindful about those times of the day. It is as with all the things. Once we understand how they work, we can use them properly. Same with those rituals. Just because everyone talks about integrating morning and evening rituals, doesn’t necessarily mean that it really works that it works for you. Most people also don’t really explain why they work and most importantly what happens if you don’t have any. If there is only one thing you take away from this article, it should be the fact, that by creating morning and evening rituals, you can have an enormous positive effect on your physical and mental health. And all it takes is being mindful about what you do during this time. Now, let’s go into the details, so you understand the real magic behind all of that (which in fact is very logical and not much magic at all). When you aren’t mindful about those times of the day, it is very likely that the way you spend those times affect you negatively. That is why I will explain in the following what happens during those times, so you understand whatever you do within this time frame, it will affect you. Which will naturally make you want to be more mindful about it. It is much less about the exact things you do or about the specific rituals than about being mindful what you do. It all starts with melatonin, our “sleep hormone”. It gets released as soon as the sun sets by the pineal gland (a small gland in our brain) and prepares our entire body for sleep. It is also a very effective antioxidant which is naturally produced in the body and therefore protects and supports the health of our nerves and cells. It reduces stress and is an important substance for our overall health. As we all know, stress is the source of many diseases, physically and mentally. The stress hormone cortisol works together with melatonin. Cortisol is the substance that makes us wake up in the morning, which is a healthy and necessary process. But when we lack melatonin, we have too much cortisol in our body throughout the day. Too much cortisol then creates too much stress in the body and can have negative effects on our overall health and well-being, and prevents us from a deep sleep at night. Melatonin gets released as soon as the sun is setting, and it is getting darker outside. The pineal gland starts to produce melatonin according to the amount of light our eyes are exposed to and makes us slowly tired, preparing our entire system for the night. You might have heard of serotonin, one of the body’s “happy hormones”. Melatonin is being produced out of serotonin. Therefore, a lack of serotonin can also cause us being low on the sleep hormone melatonin, as the body isn’t able to produce enough. The sleep-wake-cycle works mainly through our exposure to light. During the day we want to be outside, so that our body gets the impulse to produce all the substances (cortisol being one of the most important during the wake up phase) that give us energy throughout the day. That is why being outside, first thing in the morning will help you to be more energized throughout the day. The natural sunlight signalizes the body that it is daytime and time to activate the entire system again, after the night. Artificial light does not replace natural sunlight. The light has different frequencies that cannot activate the same processes within the body (that is why some people use daylight lamps in offices). The later it gets and the closer you get to bedtime, you will benefit most from not being exposed to too much light. Which includes monitors of any devices and also artificial lights. While those artificial lights aren’t enough to push your energy levels to the same extent as the sunlight, they are enough to withhold the pineal gland from producing the right amount of melatonin, that will help you sleep. If you can, use special light settings on your device at night but in general the sooner you stop using devices before you go to bed, the better. Simply the amount of time and intensity we expose ourselves to light during the first and last part of our day, has an incredible effect on our entire system, our physical and mental health. Which is particularly due to the connection and our stress-levels. Which means, if you are simply mindful about what you do during those times, you don’t necessarily need any specific rituals, to make a difference in your well-being, isn’t that amazing? 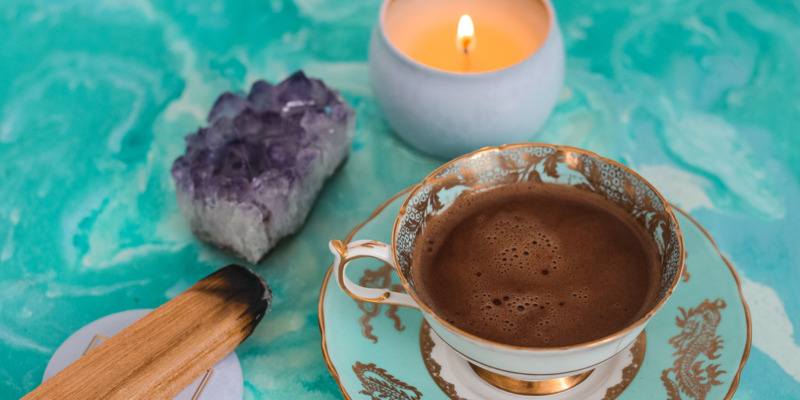 In case you are curious what rituals are most beneficial for you, I share some here with you. Now that you know, what to be aware of during those times, you can easily choose your own rituals as well. You know what to avoid and what to do to support your natural rhythm. The pineal gland, being the gland that produces melatonin and being responsible for the quality of our sleep, is also the gland that is connected with our different levels of consciousness and especially our subconsciousness. In ancient traditions it is connected to the third eye and our intuition. Meditating early in the morning is a great time because your gateway to the subconsciousness is open. You can have amazing insides from your early morning meditations and it is a very healthy way to wake up your mind smoothly after sleeping. Working with mantras, affirmations works also extremely well. They are practically your mind’s breakfast and you can kickstart the day with something like “I am enough. I am happy. I am successful. I am patient…” and your subconscious will take over for the rest of the day and make this affirmation become reality. During the night we often create tension in our body and as we didn’t move very much, our body feels a little stiff and takes some time to wake up. The melatonin levels lower in the morning and the cortisol levels rise in order to wake you up. You can support this by moving your body with some smooth stretches. Going for a walk or run or doing a workout is also a great way to activate your entire body and mind in the early morning and activate it for the rest of the day. To support the natural process that helps you wake up, exposing yourself to natural sunlight as soon as possible after you get up, is extremely beneficial. Especially if you spend a lot of time inside throughout the day, you should get some sunlight in the morning. Even when it is cloudy and seems to be much darker than in the office, the quality of light outside is different. To support your natural sleep-wake-cycle, the light outside is better even on the cloudiest of days. This is not only a good morning routine but something to keep in mind throughout the day. Science states, that spending at least 30 minutes outside in natural light, support a healthy melatonin level at night. As the production works based on the difference between light and dark. The more natural light and the more darkness, the better the sleep-wake-cycle. During especially the first hour after waking up, our level of consciousness is still affected by the melatonin level and we are more sensitive to everything we absorb through any of our senses. Which means, it is a perfect time to set an intention for the day, how you want to feel or what you want to achieve. It is a great time to listen to an uplifting podcast, music or the like. If you watch a video or read something in the morning, make it also something uplifting, positive, motivating instead of the latest news of the horrible things that media likes to talk about, which includes radio and social media. Feed your brain something that you benefit from before you interact with the tragedies of the world. It goes directly in your subconscious mind and this is a powerful tool. It will keep working with the information given, without you noticing, subconsciously. That is why setting intentions, or listen to motivational songs, and podcasts is so powerful and beneficial. Both cause stress in the body and mess with your cortisol levels. In the early morning while you still have some melatonin in your body, you should start slowly and let the cortisol levels rise naturally before you intervene with substances that skyrocket those levels in a time that will stress the body even more. Start with water or tea and fresh air, for the first hour before you slowly enjoy your morning coffee or smoke. There is no wrong or right time for conscious breathing but first thing in the morning, is an amazing time to do so! Whether that are just some deep breaths while you are still lying in bed or practicing a more intense breathing exercise, after a night in bed possibly without any fresh air, some deep breaths is exactly what your body needs! Set a timer that reminds you to put away your phone or laptop or shut down the tv. The longer the time before you go to sleep, the better. But at least 30 to 60 minutes make a big difference for your melatonin levels in the body. Computers and other devices have night modes that change the lightness of the monitors, that you can use as soon as the sun sets to further support the melatonin release. Similarly beneficial to meditating in the morning, is it before you go to bed. Your melatonin levels are high and your subconscious is easily responsive. Imagine it like brushing your teeth at night before you go to bed, you have the possibility to clean your mind before you go to bed. Just like germs in your mouth overnight can cause diseases over time, the wrong thoughts and impressions from the day, can interfere with your mental health and overall happiness and well-being. Make sure to get rid of any distracting thoughts and provide your mind with thoughts, that are healthy. Again, working with mantras/affirmations during this time is extremely powerful. Especially when you are stressed, sad or insecure about the outcome of something, you will benefit from mantras during your meditation at night. As I already said in the paragraph “conscious breathing” during the morning routines, there is no right or wrong time to breathe. At night it is a great time to release any unnecessary tension from throughout the day, physically and mentally. Whatever it is that you consume the two hours before you go to bed, do it consciously. Whether that is food, music, films, the energy of people around you – everything. While in the morning you should be conscious of that, in order not to wake up yourself too quickly, at night you don’t want to do anything that keeps you from becoming tired and calm down. If you do, see, smell, touch, eat, drink, hear or spend time around something that stresses you, your body will rise the cortisol levels in your body, which is the exact opposite to what you need in order to relax and have a good, deep, relaxing sleep. As I mentioned before, your subconsciousness is very alert at night and any information given to your mind will be absorbed very quickly, without you being aware of it (obviously, because it happens subconsciously). Anything brutal, scary, stressful, extremely sad – anything that triggers negative emotions within you, will affect you exponentially more than throughout the day. Anything that helps you relax on all levels, is great at night. We covered many mental and emotional relaxation techniques, let’s focus on the body now. Stretching, sauna, massage, a hot bath or shower, foam rolling, yin/restorative yoga – those are all things that help your body to release tension and will support your body to relax and support a deep sleep. You know yourself best. Try out different practices and find something that makes sense to you. Create rituals that you can integrate every morning and night. I wish you to be more aware of what you do first thing in the morning and last thing at night because those times have such a huge impact on us. Our days can be hectic, chaotic, stressful but also filled with joy. No matter how a day will be or was, you can influence an entire day with what you do in the morning and digest what happened on a day and prepare for the next one, with what you do at night. You have the chance to elevate your happiness and health, with simply being mindful what you do every morning and every night. Those rituals are not just a trend, they are extremely powerful and if we are not consciously about those times, they still have a massive impact on us. Maybe not the one we want to have. So let’s step into the role of being the conscious creator of our life and use the power of our natural sleep-wake-cycle. Melissa Kiss is a Professional Happy Human. She is happy and empowers others to be their happiest selves. Her goal is to wake up in a world where all beings are happy & healthy. Knowing that happiness is a choice, that requires consistent work, she is not only working with clients one-on-one in Munich, NYC, LA and on her international retreats but shares articles online, and is creating an online academy to help people all over the world to be their happiest & healthiest version. According to Melissa, bodyawareness, mindfulness and following our intuition are the three pillars to the life of our dreams.